Hello, I am Kumar Abhinav from the Machine Learning Team at Mercari Inc. Japan. We at Mercari are constantly working with cutting edge technology to enhance the customer experience and create an efficient global marketplace where anyone can buy and sell. This article is about the client-side machine learning using TensorFlow Lite and also describes the related project currently being developed at Mercari. My presentation on client-side machine learning can be found here. From building the first checkers playing machine (1952) to beating humans in Go board game (2016), machine learning has seen a lot of developments over time. Recent research aims to make machine learning more approachable and usable to the users. With the development of high computational power embedded devices, scalable and fast machine learning implementations have become feasible. This has enabled client-side (on-device) machine learning inference, replacing the need for server-based inference. Many services like Google Photos, Google Assistant, Nest and Shazam are already using client-side machine learning feature in their products[3, 4]. There are two major parts of the machine learning modeling process, training and inference. The Training process is generally bulky, where you teach your model on how to interpret data. The problem for machine learning on mobile is that training is computationally heavy. Most machine learning models today train on specialized hardware like desktop GPUs, thus it usually happens in the cloud on powerful servers. Inference, the second part of modeling process, typically requires significantly less compute power than training, making it a more realistic task for less-powerful edge devices. Client-side computing (or edge computing) is where data is processed locally rather than sending it to a cloud server. With respect to machine learning, client-side computing means inference is done on the device. Real-Time Inference: Although inference computing on edge devices is hardware dependent, it's certainly faster than waiting to retrieve API's result over the network. Analysis of live video and model inference in real-time can be achieved. Offline Capability: Client-side computing enables model inference without the need for an internet connection. End to end inference can be achieved offline if the models and labels are already present at the edge device. Data Privacy: Secure inference without any image or video sharing can be achieved as no data is being sent across the internet or stored in the cloud database. Reduction in Cost: There is a reduction in the server cost, since you no longer need ML servers. In addition to this, there is a reduction in the data transfer network cost as images or videos aren't being sent to the server. Over the past few years, the open source community has worked on solutions for client-side machine learning inference. Some of the popular tools for client-side machine learning are TensorFlow Lite (Google), Core ML (Apple), Caffe2Go (Facebook) and ML Kit (Google). TensorFlow Lite is used in this article as a tool to explain client-side machine learning. 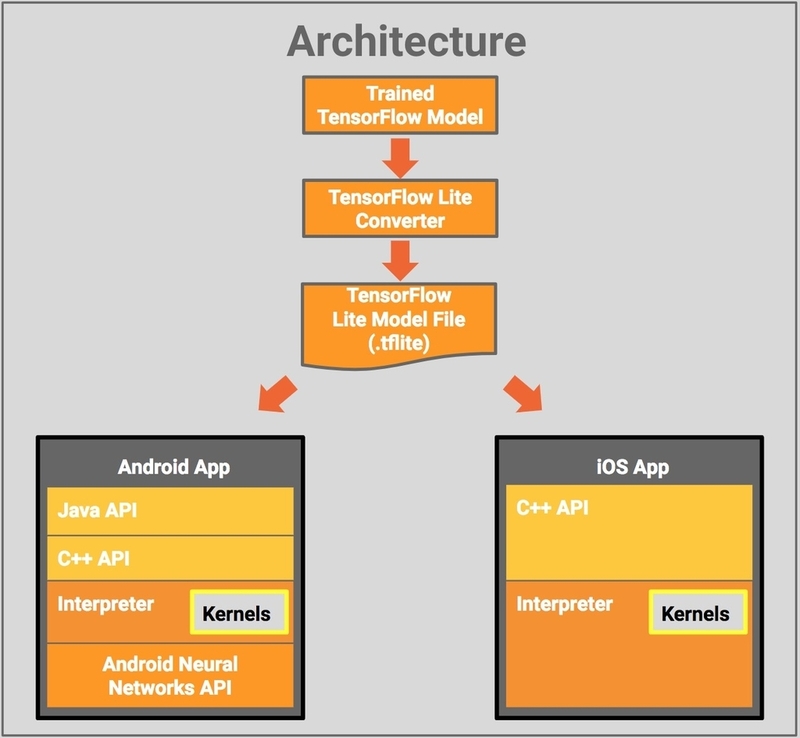 TensorFlow Lite (or TFLite) is the lightweight client-side machine learning inference tool for mobile and embedded devices from the TensorFlow community. The predecessor to TFLite is TensorFlow Mobile, being the first mobile machine learning tool from TensorFlow. However, TFLite, introduced in May 2017, is seen as an evolution of TFMobile with smaller binary size, fewer dependencies, and better performance. TensorFlow Lite is currently supported for Android, iOS and Raspberry Pi. 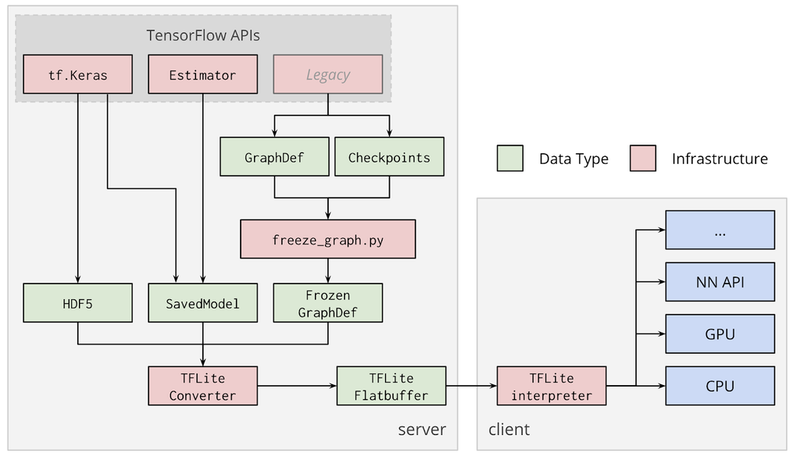 TensorFlow Lite use FlatBuffers-based model file format (called .tflite), replacing the Protocol Buffers used by TensorFlow. FlatBuffers are memory efficient and lightweight with a tiny code footprint and are generally used in the gaming industry. They are cross-platform and are flexible with forward and backward compatibility. The primary difference from Protocol Buffers is that FlatBuffers don't need a parsing or unpacking step to a secondary representation before accessing the data. Additionally, Protocol Buffers do not support optional text import/export nor schema language features like unions. TensorFlow Lite supports a set of core operators tuned for mobile platforms, both quantized and float. It incorporates pre-fused activations and biases to enhance performance and quantization accuracy. The TFLite kernels are smaller than 300KB when all supported operators are loaded. It also has Java and C++ API support along with model support for InceptionV3, MobileNets, and other common model architectures. At first, the trained TensorFlow model is converted to the TensorFlow Lite file format (.tflite). The converted model file can then be deployed in the desired mobile application. Java API is provided for Android App which acts as a convenience wrapper around C++ API. C++ API is available for both Android and iOS, which is used for loading the TFLite model file and invoking the interpreter. The Interpreter executes the .tflite model using a set of kernels. The Interpreter uses Android Neural Networks API for hardware acceleration on select Android devices, else CPU execution is carried out for normal devices. TensorFlow Lite Converter and Interpreter [Source]. Any of the first three input file formats can be converted to FlatBuffer format (.tflite) by TensorFlow Lite Converter either from Python API or from Command Line. However conversion of a model from tf.Session can only be done through Python API. Inference can also be achieved within a graph session without actually saving the FlatBuffer based file. Unlike CPUs, GPUs compute with 16-bit or 32-bit floating point numbers and do not require quantization for optimal performance. [...] GPUs carry out the computations in a very efficient and optimized manner, so that they consume less power and generate less heat than when the same task is run on CPUs. See TensorFlow Lite GPU delegate Documentation. However, some operations that are trivial on the CPU may have a high cost on GPU inference (e.g. Reshape ops: BATCH_TO_SPACE, SPACE_TO_BATCH, SPACE_TO_DEPTH). Also on GPU, tensor data is sliced into 4-channels. Thus, a computation on a tensor of shape [B,H,W,5] will perform about the same as on a tensor of shape [B,H,W,8] but significantly worse than [B,H,W,4]. TensorFlow Lite doesn't accept variable input image size, only the first value (batch size) of input tensor can be variable, e.g. : T = [?, 224, 224, 3]. Current TensorFlow Lite implementation doesn't support uint8 during model training thus it is advised to use float32. There is little or no support available for tf.float16 and strings. Not all operators of TensorFlow are supported in TensorFlow Lite. TensorFlow Lite supports only TensorFlow's NHWC data format. We at Mercari are working on Client-Side Similar Image Search project powered with TensorFlow Lite for Android devices. We are using MobileNet V2 based feature extraction model for our purpose. The input image tensor is of the form [224, 224, 3] and the output tensor is the Global Average Pooling Layer of vector length 1792, generated using the hyperparameter width multiplier (1.4). We have quantized the model using TFLite from 17.6 MB (Original TF Model) to 4.4 MB (Quantized TFLite Model). The similar items results are generated from the image pool of ~10 million Mercari item listing. The ranking of various Android devices performance on different machine learning tasks can be found here. Model Size: Since the machine learning models are deployed on edge devices, there is a restriction on the model's size due to hardware and processing power. Lightweight applications are required for customers for efficient implementation. Accuracy: Client-side computing comes with accuracy-size tradeoff where many weak and small networks may face large accuracy drop. Device Dependency: Inference time depends a lot on the edge device's configuration and working condition. Model Version Update: Update to the machine learning models is difficult as compared to server-side implementation as updates can only be done through applications update, which can't be frequently implemented. Application Portability: Porting the application to a different platform may be difficult and the inference parts are needed to be rewritten for each of the platforms. Customer Data: Since there is no transfer of data to the server, there is a limitation on gathering real customer training data for improving machine learning. Since this field is new in the machine learning domain, there are still a lot of challenges left to be fixed. In the future, there would be a lot of improvements done to tackle the above-discussed challenges. Thank you for reading this article and I hope this would encourage new people to join this domain and contribute to more customer friendly machine learning applications. Samuel, Arthur L. "Some studies in machine learning using the game of checkers. II—Recent progress." IBM Journal of research and development 11.6 (1967): 601-617. Silver, David, et al. "Mastering the game of Go with deep neural networks and tree search." nature 529.7587 (2016): 484. Szegedy, Christian, et al. "Rethinking the inception architecture for computer vision." Proceedings of the IEEE conference on computer vision and pattern recognition. 2016.